On 1 September 2014 Charlotte and I were fortunate enough to depart Christchurch International Airport on a plane for Pu Dong airport, Shanghai, with a further transfer booked for Gansu Province. We were leaving our home of New Zealand for two months to participate in the 2014 Gansu Fellowship - Charlotte representing Christchurch City Council and myself representing Selwyn District Council. Only having recently met, neither of us knew quite what we were in for. Having both been to China previously on separate occasions for the University of Canterbury paper Mgmt228, Chinese Business Practices we had a general idea of the Chinese culture, however neither of us had ever visited the more remote Western China. I must admit some of these countries I didn't even know existed so I had to have a look at a Map of the World to deepen my knowledge. Although all delegates could speak a degree of English we were the only native English speakers and as a result patience could sometimes be tested. There were a couple of delegates in the group who could speak Chinese and they too were regularly asked questions, most often when we were trying to order dinner! In our downtime we went on outings to the local markets and shops as well as socialising with other delegates and learning about their home countries and culture. At the end of September was the Chinese Autumn Festival in which we had a week off classes. The majority of our group decided to take the time to visit Xi'an. This was a fun time however it was extremely busy with a lot of the Chinese obviously wanting to visit Xi'an in their festival break also. 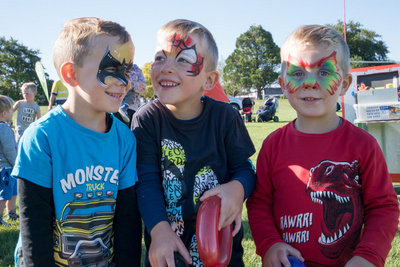 October provided us great opportunities to go on overnight trips and visit other areas in the province. 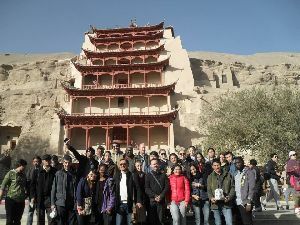 We had some great trips to Tianshui and Linxia with a grant trip at the end up the Hexi Corridor to Duhuang learning both about the ancient silk road as well as the modern economic belt. 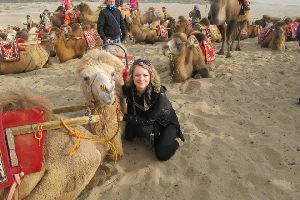 Highlights included seeing the Rewi Alley memorial museum in Shandan, visiting the most Western point of the Great Wall of China and visiting the sand dunes and riding camels in the Gobi Desert. 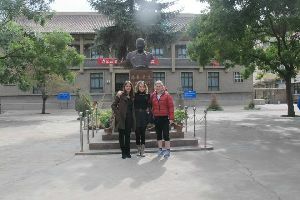 The Gansu Foreign Affairs Office provided exceptional hospitality. Charlotte and I were both honoured to represent our respective Councils and also to represent New Zealand. It was evident that New Zealand has established a great relationship with Gansu Province, being seated at the main table for both the Opening and Closing Ceremony reaffirmed this and I would like to commend both the Selwyn and Christchurch District Councils for all their hard work they put in to maintain these ties. On behalf of Charlotte and myself we would like to thank you for all the time and support that was put into our orientation prior to departing for China, especially with Kelvin taking us out for the afternoon to see the Rewi Alley memorial in Springfield and the developments that are happening in Rolleston. This allowed me in particular to have a stronger understanding of the area which I was representing. 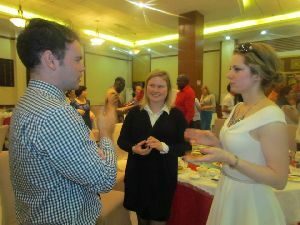 The Gansu Fellowship was a life changing experience and what we learnt will stay with us for life. We learnt a lot more about Western China and their ancient history and strengthened our knowledge of the language. We gained knowledge about Chinese culture that will be invaluable for our future careers and wish to maintain our ties with the Chinese Community in Christchurch. On a personal level we also learnt a lot about ourselves and what we are capable of achieving when placed into an unfamiliar environment. Making lifelong friends was also a bonus along the way. Once again thank you for such a wonderful opportunity, we tried our hardest to be great ambassadors for the Council and would not hesitate to recommend this opportunity to future potential delegates.